Finland’s geographic location makes it the best place to watch the Northern Lights. These beautiful auroras can be visible up to 200 nights per year and enjoyed from the comfort of a glass igloo. Igloos are specially designed for viewing the Northern Lights and there are currently more than 30 igloo hotel accommodations in Finland that offer glass igloo cabins. Some of these accommodations are in luxury resorts while others are hidden in the wilderness with limited facilities. Some igloos have a kitchenette, private sauna, a bedroom, and fireplace depending on where you decide to stay at and your budget. Please note: The demand for cabins is huge, as well as the choice of accommodation that resulted. Here is our comprehensive list of all the aurora glass cabins in Finland, where you can enjoy the truly unique Northern Lights igloo holidays. The world famous Kakslauttanen Arctic Resort offers many different types of lodging from luxurious log cabins to iconic glass igloos. Facilities: 2 restaurants available with 6 saunas for all to use. The glass igloos are available to book from end of August to mid April. What's special about this hotel? 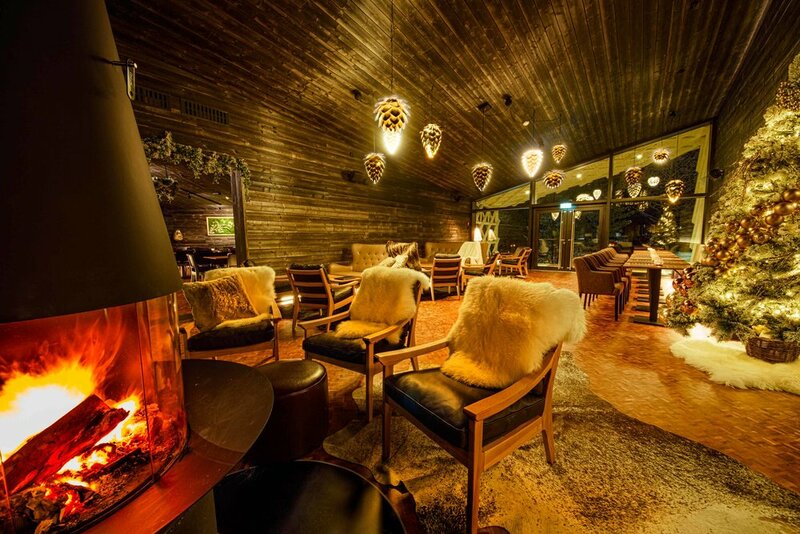 This hotel has the world’s largest smoke sauna with its own restaurant and relaxation area with an open fireplace. You can cool off in a nearby ice hole afterwards. Urho Kekkonen National Park is just 5 km away. Does the hotel offer any activities? Yes,the hotel can arrange Husky and reindeer safaris as well as snowmobiling. Cross country skis are also available for rent. Facilities: The small glass igloos have shared shower and toilet facilities. Sleeps 2 persons with the option of an extra bed. Free WiFi. What's special about this accommodation? Views of the auroras from the glass roof. Facilities: A sauna and shower can be found in separate buildings. Sleeps up to 4 persons. Free WiFi. What's special about this accommodation? Each large igloo comes with a relaxation room and an open fireplace. Urho Kekkonen National Park is just 5 km away. The Large Glass Igloos have their own toilet and shower unlike the Small Glass Igloos. Facilities: private sauna, sleeps up to 6 people, kitchenette, fireplace. What's special about this accommodation? The beautiful glass roof offers breathtaking aurora views. Own fireplace and sauna. 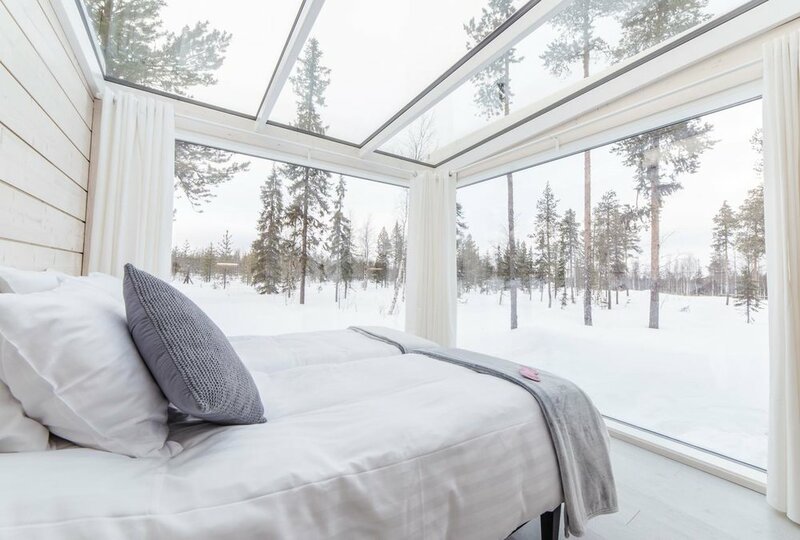 This resort offers luxury igloo glass apartments within proximity of the popular town, Rovaniemi. If you are looking for a more luxurious accommodation this is your choice! Facilities: the hotel has an ice restaurant, a cafe, and an ice bar. The apartments are decorated in Scandinavian style with traditional features. What's special about this hotel? Popular location right next door to Santa Claus on the Arctic Circle. Great for families. Rovaniemi city centre is only 15 minutes by car and Rovaniemi Airport just five minutes away. Does the hotel offer any activities? Yes, snowman safaris, aurora safaris and guided tours of the Snowman World Winter Zone are available upon request. Facilities: every 40 sqm superior glass apartment comes with a living room, kitchenette, loft access to private hot tub and sauna. There is a double bed with possibility of 2 extra beds. Internet connection, flat-screen TV, toiletries, bathrobes, and a safety deposit box. Breakfast is included. Toilet and bathroom, water kettle, fridge, coffee maker, microwave, stove, tableware for four persons, linen, towels, slippers, bathrobes, and luggage service available upon request. What's special about this accommodation? Has glass ceiling for aurora watching and own private hot spring outdoor spa and sauna. The shape of the glass structures is inspired by the classic “kota” huts, which were used by the native Sámi people. The luxurious igloos at this resort are intended for year round use and are located at the gateway to the famous Pyhä-Luosto National Park. Facilities: restaurant. All the rooms have own sauna. This hotel offers a wide range of hotel rooms from premium to superior including aurora. The 25-40 sqm rooms are spacious and situated on three floors. What's special about this hotel? 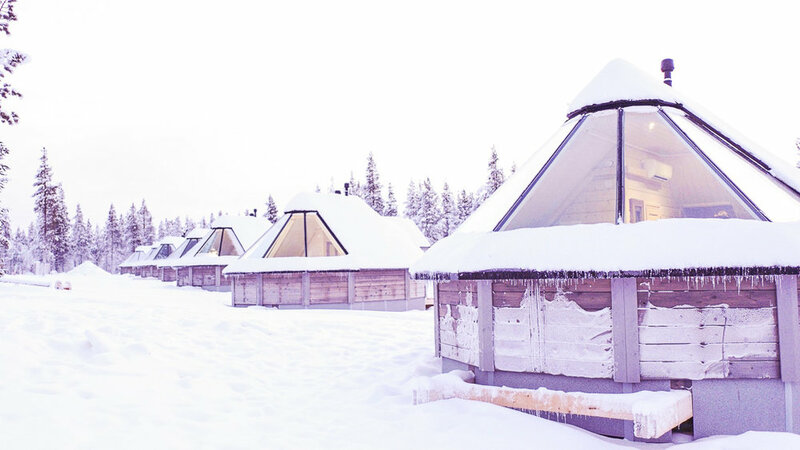 Santa’s hotel has just built 10 new luxury glass cabins in this igloo village. This is where you will feel closer to nature with Luosto’s unique landscape outside your window. The location of this resort is excellent as it’s close to one of the best national parks in Finland, Pyhä-Luosto. Does the hotel offer any activities? Yes, snowmobiling, reindeer and husky safaris in the forest and snowshoe hiking to the unspoiled fell slopes, skiing, visits to Pyhä-Luosto Husky and Reindeer Park and a visit to the Amethyst Mine. Facilities: Santa’s glass igloos have fully equipped toilet and shower. Breakfast and other catering services are just a stone’s throw away from the cabins. Own sauna and fireplace. What's special about this accommodation? Unique rooms with glass ceiling and walls for full view of the auroras. Children under 4-years of age are free of charge. This unique resort offers stunning arctic view rooms with luxury glass igloos. Facilities: on-site restaurant for breakfast, lunch, and dinner. What's special about this hotel? This igloo hotel Rovaniemi is just 8 km from centre of town. Santa Claus Village and Husky Park are only 600 metres away. Facilities: free WiFi. All the igloos are heated and have their own bathroom with a rain shower. Slippers and bathrobes are also provided. There is an electric kettle and flat-screen TV in all the rooms. What's special about this accommodation?Each igloo is equipped with a tablet through which you can get in touch with the reception to receive Northern Lights alarms. This hotel proves that you can experience luxury in the middle of the rugged fell mountains thanks to its personalised and heartwarming service. Facilities: This family-owned hotel offers 24 glass igloos in the heart of Finnish Lapland, a restaurant, and outdoor Jacuzzi. What's special about this hotel? it's only 10 km from Levi resort and only a 15-minute drive from the Kittilä Airport. Ski lifts are only 5 km away. Does the hotel offer any activities? Yes, safaris, snowshoeing, reindeer safaris and reindeer farm visits are available on request. The hotel can also help you book other winter activities in the Levi centre. What's special about this accommodation? You can stay the night in an igloo under Northern Lights in a 5-star luxury hotel. The Premium igloos are situated in a prime location on the side of the fell with an unobstructed view of the valley. They are especially popular with honeymooners and young couples. Hot tub available? No but there is an outdoor Jacuzzi. Facilities: a total of 19,23 sqm superior units suitable for 2 people plus 2 children. Breakfast included. Kitchenette with kettle, coffee maker, oven, fridge, WiFi, hairdryer, radio, sofa bed, shower and toilet. What's special about this accommodation? An aurora borealis igloo in this Finland Northern Lights hotel offers unobstructed views of the fell and the sky at night. The superior igloos are perfect for a family of 4 with the option of two extra beds for children under the age of 12. To increase your chances of seeing the auroras, this is one of those rate hotels that benefits from no light pollution and is located on the aurora zone. Facilities: the hotel’s restaurant is just 2 km away. What's special about this hotel? This property is situated in the most tranquil area with no noise or traffic, where you can enjoy complete isolation in wilderness. Right on the aurora zone. No light pollution. Does the hotel offer any activities? 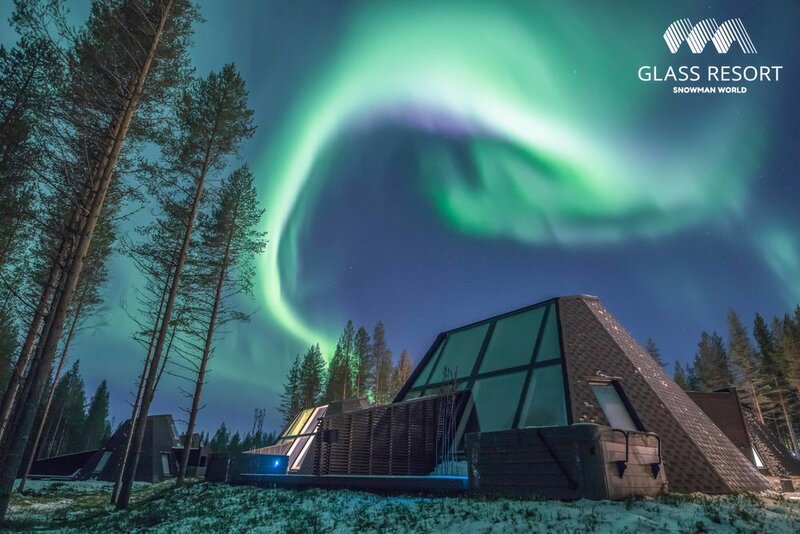 Yes, this Finland glass igloo resort offers nighttime aurora photography workshops, aurora watching by snowmobile, reindeer, or Husky during the evening, Northern Lights chasing by car, snowshoe walks under the auroras, snowmobile tours, fatbiking, cultural tours to museums, ice fishing, and ice karting. Facilities: 25 aurora cabins available to book, free WiFi and private bathroom. Heated windows. Coffee and tea making equipment. Suitable for up to 4 persons. Twin or king size beds. What's special about this accommodation? The cabins are placed quite apart from one another for utmost privacy. Aurora alert. Winner of World Luxury Hotel 2017, the Seaside Glass Villa is located by the frozen sea in the SnowCastle area. What's special about this hotel? 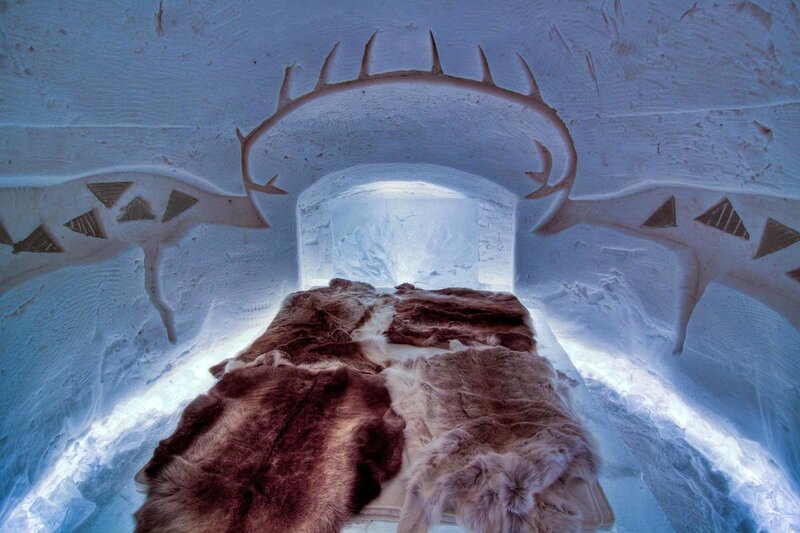 Snow Hotel with rooms made from ice. Restaurants are only a short walking distance and the city centre is 1km away. Spacious villas with huge glass windows. Does the hotel offer any activities? Yes, lots of snow and ice adventures, aurora camping in snowmobiles, Arctic island hopping, ice fishing, a tour in an all-terrain vehicle on the frozen sea, cross-country skiing courses, fatbike safari, SnowCastle tour, hovercraft ride, ice karting, ice breaker Sampo cruise, and Northern Lights tour in an all-terrain vehicle. Facilities: the one-bedroom villas offer air conditioning, kitchen, private bathroom, and WiFi. What's special about this accommodation? These unique villas are situated by the frozen sea and offer stunning views of the Bothnia Bay. You can enjoy the arctic freedom with the views of SnowCastle from the comfort of your own villa. Located approx. 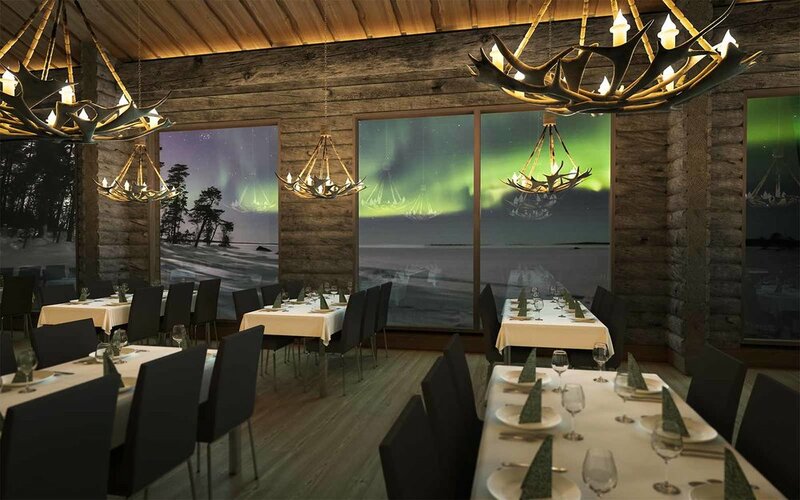 800 kilometres north of Helsinki, The Arctic Treehouse Hotel provides luxury comfort in the heart of Lappish nature, with an award-winning restaurant and state-of-the-art facilities. Facilities: 3 different accommodation types, Arctic GlassHouses, Arctic TreeHouse Suites, ArcticScene Executive Suites, restaurant, spa with sauna and Jacuzzi available for all the guests at the Arctic Forest Spa. What's special about this hotel? Santa Claus Village is only 2 km away. Central Rovaniemi is just under 6 km from the hotel. An authentic Finnish sauna from where you can admire the northern lights or the midnight sun in the Jacuzzi with a glass of champagne. Winner of World’s Luxury Restaurants Award 2018. Ideal for families with small children and couples. Does the hotel offer any activities? Yes, a visit to Santa Park, go on an Arctic safari, find the Santa Claus secret forest, pre-arranged visits to reindeer or Husky farms, snowmobile safaris, ice fishing, ice floating and taking northern lights flights, where you will take a closer look at this natural phenomenon, private dining experiences, and tailor-made experiences. Facilities: this Northern Lights igloo hotel offers 5 Arctic GlassHouses with 2 bedrooms and high-quality double beds for accommodating up to 6 people. The sofa in the living room can also be turned into a sofa bed. A kitchenette with all the equipment and a private sauna in all the suites. Private bathroom with shower and toilet. Free WiFi, fridge, coffee tableware, kettle, espresso machine, cooking hob, air con, kitchen sink, safe, and minibar. The huge glass windows and roof are perfect for watching the auroras at night. Breakfast is included in the price. What's special about this accommodation? Spacious decking area (22 sqm) offering amazing views of the northern skies, has its own sauna and a real fireplace. Facilities: 7 Arctic TreeHouse suites with glass windows instead of glass roofs with the possibility of still seeing the Northern Lights whilst lying on your bed. Double beds or two single beds. Private bathroom with shower and toilet. Free WiFi, fridge, espresso machine, coffee tableware, kettle, safe, flat-screen TV, air conditioning, and minibar. Rain shower heads and underfloor heating. Breakfast is included in the price. What's special about this accommodation? The focal point of these elegantly decorated rooms is the panoramic window that offers the most amazing views of the night sky over the treetops. Facilities: Executive suites have private sauna, two separate bathrooms with shower and toilet. Extra beds for three persons. The bedroom has a custom-made king size bed and a separate spa area with floor to ceiling windows for full views. Separate living room. Free WiFi, fridge and minibar. King size bed, umbrella, Nespresso machine, coffee tableware, kettle, safe, 2 flat-screen TVs, air con, yoga equipment, wellness basket. What's special about this accommodation? The suites have a separate bedroom and living room, where the large bed and sofa can accommodate larger families. The spa area has a scenery sauna, bath, a separate shower and a make-up area. You can enjoy the views of the forest from the privacy of your own wellness area. This hotel is located in the unique village of Iisakki in Ruka area, where guests can enjoy the breathtaking views of the surrounding nature. Facilities: 10 villas by the beach with private sauna and outdoor Jacuzzi. Open all-year round. What's special about this hotel? Plenty of restaurants within proximity. Offers uniquely shaped glass villas, cottages, and apartments. Does the hotel offer any activities? Yes,Snowmobile introduction lessons (2.5 hours), aurora snowshoe hiking with free ski rental equipment. Winter clothing (overall, boots, gloves) as well as snowshoes and forest ski rental free of charge. Facilities: this villa can accommodate up to two people and it comes with kitchenette, toilet, and shower. You can enjoy a private sauna or an outdoor Jacuzzi on the beach for extra fee. The 10 glass wall villas with huge windows and glass roofs were recently built in autumn 2017. Breakfast included. What's special about this accommodation? Located by the lake Rukajärvi. Stunning views. This hotel is in a unique location for all those looking for an active holiday in Finland. Facilities: There is a restaurant and terrace on site. Muotka Igloos also offers shuttle service and ski equipment for hire. What's special about this hotel? Ideal for families and couples. This igloo hotel offers a wide range of fun activities for adventure seekers. It is deep in Taiga forest and Saariselkä ski resort is only 15 minutes away. Does the hotel offer any activities? Yes, snowmobiling in wilderness, ice fishing with sleigh, reindeer farm visit, Husky safari, snowshoeing, cross country skiing, aurora snowmobiling, aurora camping, aurora hunting by car, aurora snowshoeing. Facilities: Sauna, double beds, bathroom with toiletries, and 2 single sofas. What's special about this accommodation? Close to Ivalo Airport. Next to the Urho Kekkonen National Park and away from noise and air pollution of Kakslauttanen. Has its own private sauna. Complimentary champagne for guests. The cosy family-owned Wilderness Hotel Nellim is close to the legendary Inari Lake and Sarmi. Its rooms are decorated with the same styling as the Sami culture nestled amongst the Vätsäri wilderness area. Facilities: restaurant serving traditional Finnish food. The hotel offers a wide range of accommodation including log cabins and apartments. What's special about this hotel? this Northern Lights hotel offers unique accommodation in the shape of aurora bubbles overlooking theLake Inari. Does the hotel offer any activities? Yes, you can go on a 2-hour snowmobile tour, Husky safaris, ice fishing with our without snowmobile, gentle snowshoeing, aurora camping, aurora snowshoeing, aurora hunting by car, private aurora sledge safari, hiking trips at night and visit a reindeer farm. Cross-country skiing tracks can be found close to the hotel and you can rent ski gear or rowing boats from this glass igloo hotel. Facilities: although the bubbles have limited space for luggage, they are perfect for 2 people who are looking for an overnight stay in an aurora cabin. 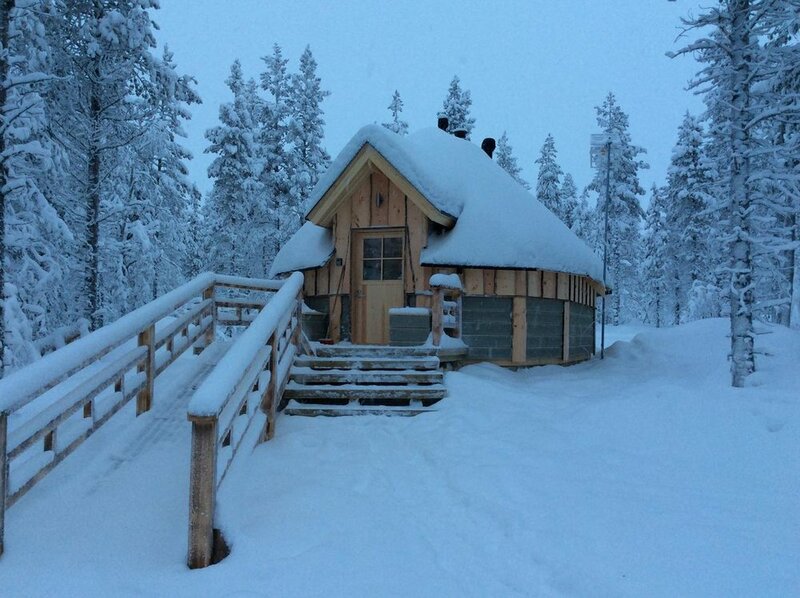 Each bubble in this Lapland igloo hotel comes with a private toilet and double bed. What's special about this accommodation? the most unique way of experiencing the auroras from a bubble-shaped igloo. Facilities: private toilet, double beds and space for an extra bed. Limited space for luggage. What's special about this accommodation? the shape of these huts is inspired by the traditional Sami cabins known as Kota. 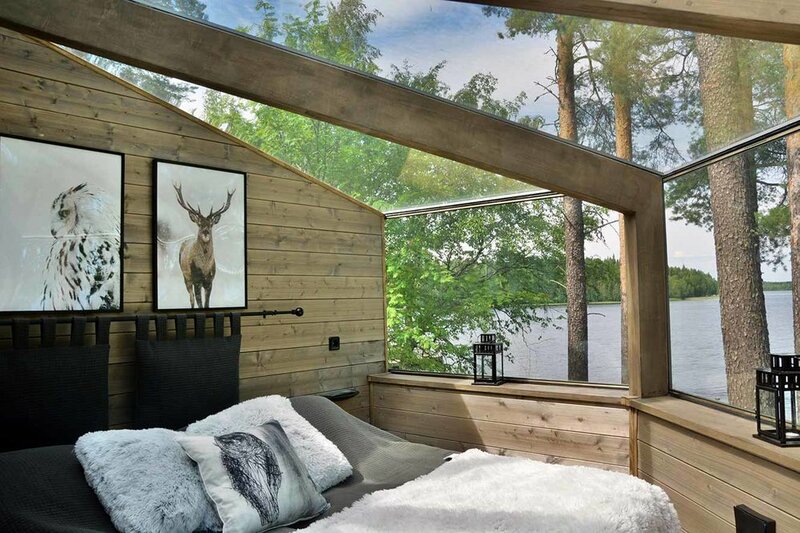 The hut has glass roof from where you can watch the auroras from your bed at night. Located by the picturesque Inari Lake, this hotel has a themed style with a blend of comfort and class. Facilities: On-site restaurant for breakfast lunch and dinner. Offers a wide range of lake cabins, aurora huts, and villas by the lake. What's special about this hotel? stunning views of Inari Lake.This Northern Lights igloo hotel is only 32 km away from Ivalo and the airport is 35 km away. Does the hotel offer any activities? Yes, snowmobiling in wilderness, ice fishing with snowmobile, reindeer farm visit, Husky safari, snowshoeing, cross country skiing, aurora snowmobiling, aurora camping, aurora snowshoeing, aurora hunting by car, and learning about Sami culture by sampling the Lappish food. Facilities: a brand new hotel opposite Inari Lake. Only 12 polar aurora cabins with glass thermal roof. Twin beds with the possibility for extra beds. Every 34 sqm cabin has a private bathroom, shower and toiletries, electric kettle, and sofa. WiFi in the main building. What's special about this accommodation? A complimentary champagne for guests. Thermal glass roof stays clear from ice and snow for unobstructed views of the sky. This glass-roofed village allows you to spend an unforgettable night under the auroras in the comfort of your own igloo. What's special about this hotel? Spa and shopping amenities are only 350 metres away. The hotel has its own reindeer paddock, where you can get close to the reindeer. The nearest airport to Northern Lights Village is Ivalo Airport, 26 km away. Its own ice bar and restaurant. Breakfast and dinner. Luggage storage. Does the hotel offer any activities? Yes, photography workshop, cross country skiing lessons, aurora camping by the lake, aurora hunting on a sleigh, aurora hunting by snowmobile, aurora hunting by limousine, day trip to Nellim, searching for Santa, reindeer day, Husky safari, snowshoeing in the fells, cross-country skiing lessons, and ice karting. Facilities: Laser heated sky windows, bathroom and shower, water heater, double bed, hairdryer, minibar, unlimited Internet connection. With so many cabins next to each other, the resort feels like mass tourism, but the rooms are spacious enough (29 sqm) to make you feel comfortable. Option for two extra beds. What's special about this accommodation? Each cabin is lined by uninhabited forests and fells. Laser heated glass roof opens up to the sky. This award-winning hotel has combined the concept of winter activities, accommodation, and hospitality in a perfect blend for guests to enjoy. Facilities: guests have access to a smoke sauna, pool, restaurant and an arctic spa with beauty and wellness treatments. The hotel also offers a personal trainer and mountain bike rentals. What's special about this hotel? Telegraph voted this hotel as the World's 4th most romantic suite. It has also won the World Ski Awards. Cross country skiing tracks are right by the hotel’s doorstep. 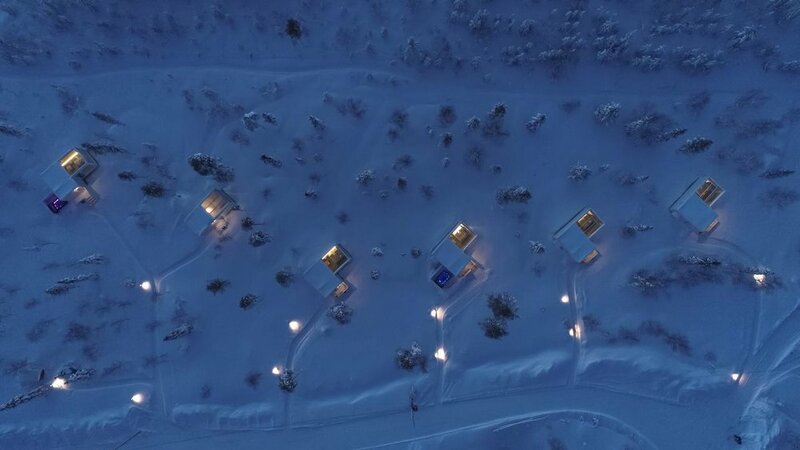 The hotel has built real snow igloos on top of the Iso Syöte hill, where you can stay overnight in a true Finland igloo made from snow in special sleeping bags. There is a lake nearby as well as a wilderness camp. Ski lovers will have the luxury of a ski trail right at their doorstep. Does the hotel offer any activities? Yes, the hotel staff can arrange snowmobile tours, weekly safari programs, fatbike adventures through the snow, Northern Lights safaris, Husky safaris, or ice karting. Facilities: The spacious suite is on two floors with a living room, cosy fireplace and luxury bathroom with private sauna. What's special about this accommodation? Eagle view suit looks over the surrounding hills, forest and into the Northern Lights sky from the comfort of your igloo. Own Jacuzzi. The walls and the roof are made of glass for panoramic views of the sky and the nature. Facilities: Each luxury suite comes with its own bathroom, private sauna, an outdoor Jacuzzi on the balcony, and a double bed. The suite is on two floors with comfortable sofas. What's special about this accommodation? 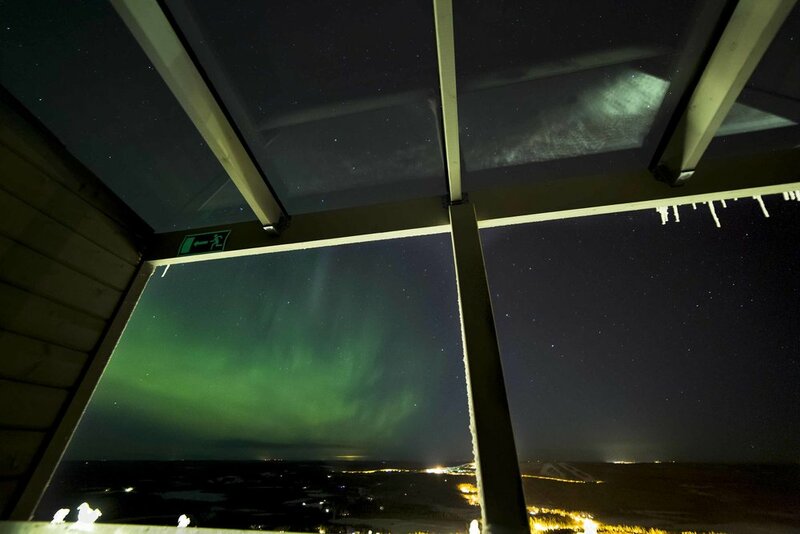 The glass façade and the balcony of Aurora View Cabins provide stunning views of the Northern Lights. The suite is surrounded by a valley and forest. Its own sauna and Jacuzzi. This hotel is in an ideal spot for discovering the nature, wildlife and the auroras in Ranua. Facilities: this hotel offers a wide range of accommodation from single rooms to igloos. On-site restaurant. What's special about this hotel? The hotel offers free Northern Light tours every night during the winter season. The Ranua Zoo and Wildlife Park are just 2.5 km away. Does the hotel offer any activities? Yes,the hotel offers Northern Lights tours, fishing, hunting, trekking, and cross-country skiing. Facilities: each igloo has a TV, tea/coffee facilities, WiFi, and a private bathroom and shower. The extras include a minibar and a seating area. You can enjoy the views of the garden and the lake from your own private sauna. What's special about this accommodation? Own sauna. Great for families and couples. Huge glass windows and roof. Located far away from noise and light pollution, this cosy hotel is located in an ideal spot for aurora watching. 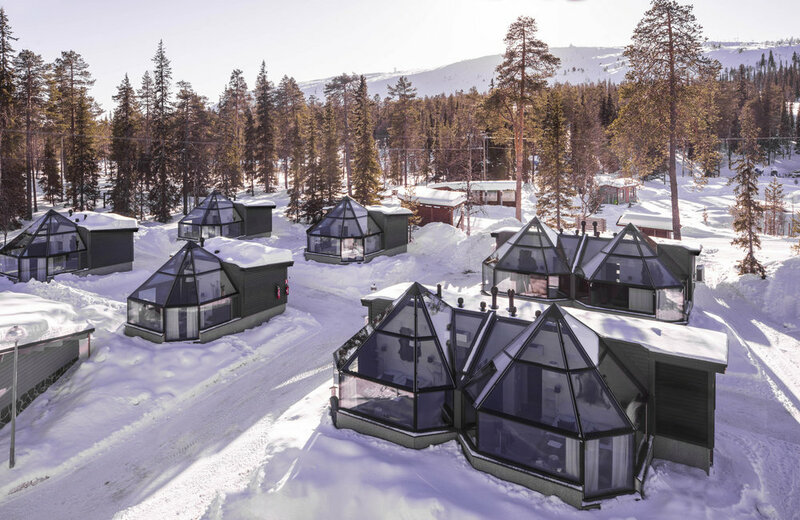 Facilities: the very first 15 igloos were built in 2014, but soon after, the hotel increased their igloo building and now there are 39 glass cabins available. There is also an ice restaurant and ice bar on this resort. Women can enjoy the Finnish sauna or outdoor Jacuzzi at 9pm to 10pm and 8am to 9am. For men, the sauna and Jacuzzi are available at 10pm to 11pm and 9am to 10am. Does the hotel offer any activities? Yes, snowshoe hiking, sculpting snow, ice fishing, electric snowmobile safaris, and a visit to a local Finnish home. It is also possible to borrow snowshoes, toboggans and kick sledges from the hotel for free. Facilities: The Arctic SnowHotel offers 20 sqm twin glass cabins for up to 3 persons, with an optional third bed. Each cabin has its own toilet, shower, kettle, hairdryer, and fridge. The igloo is made from electrically heated glass. Breakfast included. What's special about this accommodation? These 360-degree glass roofs provide you with the most beautiful views of the skies. Beds are motorised so you can adjust them for optimal viewing experience. Facilities: The family glass igloos are 33 sqm with own toilet and shower as well as fridge, electric kettle, and hairdryer. There are four single beds, which are motorised for aurora watching. Option for adding a fifth bed. Breakfast included. What's special about this accommodation? The Family Glass Cabins can accommodate up to 5 persons. Ideal for families with children. Guests can enjoy the full view of the night sky with 360 degree glass roof. Located on a private beach area in the town of Hankasalmi, 41 kilometres away from Jyväskylä, this property offers cottages and a 50s inspired American-themed restaurant. Facilities: the hotel offers a beach hut sauna, wooden hot tub, mini golf course, and restaurant. What's special about this hotel? has a smoke sauna and hot tub. The cottages are located on a beautiful lake and the golf course. Does the hotel offer any activities? Yes, billiards, tennis, skiing, bowling, and darts. Fat bike safaris, snowshoeing, ice fishing, kick sledges, snowboarding, horse sleigh trips, cross country skiing, and skiing. Facilities: each of the All-sky Aurora cabins has a bedroom, a kitchenette, shower and toilet, with breakfast included. Suitable for 2 persons. What's special about this accommodation? The cabins are right by the lake and a short distance from the restaurant and a ski slope. The heated glass guarantees an obstructed view of the night sky in winter. Telescope available (camera can be attached for photographing the auroras). Facilities: every All-sky Aurora cabin has two bedrooms, a kitchenette with kettle, bathroom, shower, and toilet with breakfast included in the price. Suitable for 4 persons. What's special about this accommodation? The cabins are right by the lake and there is a ski slope nearby. The heated glass guarantees an obstructed view of the night sky in winter. Telescope available (camera can be attached for photographing the auroras). 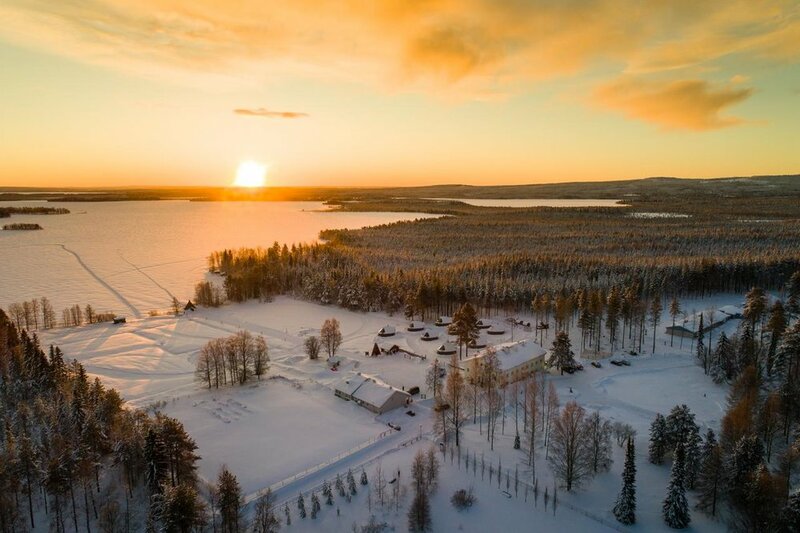 Set in the Lapland region, Revontulikota is a 4-star hotel that boasts many amenities and facilities right on its doorstep. Facilities:ski storage, free parking, grocery deliveries, and airport shuttle service. What's special about this hotel? Suitable for long stay and ideal for ski lovers. Does the hotel offer any activities? Yes, skiing, Northern Lights, husky and reindeer safaris, snowmobile safaris. Facilities: igloo-style holiday cabin suitable for two people. Kitchen living room, shower and toilet,TV, and fireplace. Glass roof with view to the sky. Free WiFi. What's special about this accommodation? own sauna and there is a telescope available (camera can be attached for capturing the Northern Lights). With spectacular views over Saariselkä, the newly established Star Arctic Hotel offers top quality services for reasonable prices. Facilities: The hotel is a true architectural masterpiece, with contemporary design rooms surrounded by nature. There is a restaurant, bar, sauna, shop, and transport services. What's special about this hotel? This Finland aurora borealis hotel only just opened on December 2017. It is located on top of the Kaunispää mountain with panorama view over Saariselkä winter resort and Lapland. One of the best locations for ski lovers. Does the hotel offer any activities? Yes, Northern Lights tours, sledding, downhill snowboarding, cross country skiing, husky and wildlife safaris, snowmobile safari, and ice fishing. The hotel also offers ski equipment hire and ski storage. Facilities: 8 cabins available to book. 20 sqm room for 2-4 persons. 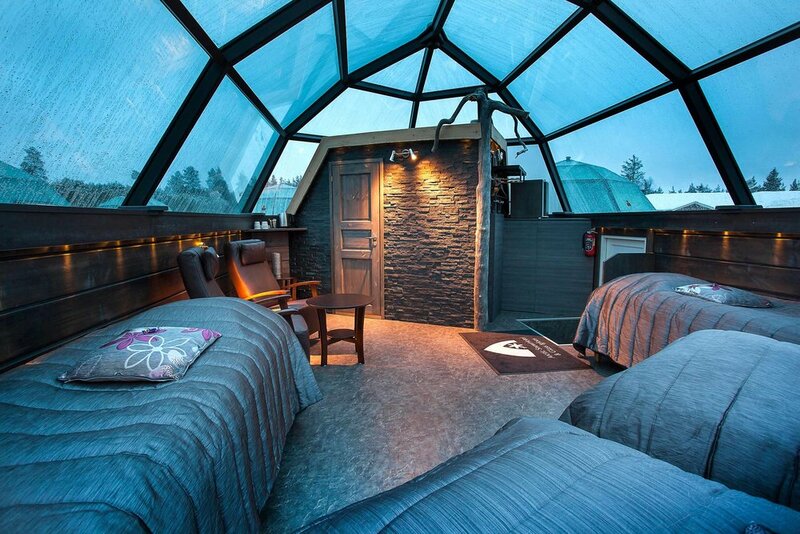 Above each igloo’s bed, a three panel glass allows you to enjoy the auroras at nights. Free WiFi and breakfast included. Geothermal heating system, headboard desk, safety deposit box, slippers, hairdryer, kettle, flat-screen TV, coffee and tea tray, mini fridge and minibar. Toilet and shower. What's special about this accommodation? The three panel glass windows allows you to enjoy the auroras at night. As a downside, there is too much light pollution due to the fact that it overlooks the Saariselkä village, which is not good for aurora watching. 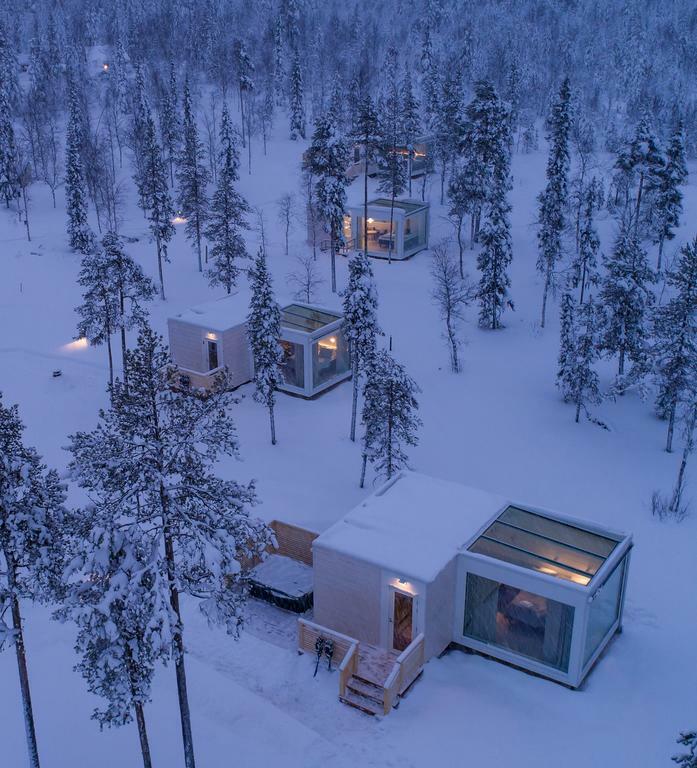 The igloos of this hotel are located on the peaceful and pristine Pyhätunturi in Finnish Lapland. The area is remote yet the hotel is easily accessible. Facilities: a car, a camping van for 9 persons, a snowmobile, and a covered ATV are available for rent upon request. What's special about this hotel? The ecological and energy-efficient igloos offer a glimpse of the typical Scandinavian life. The Perhehissi ski resort is a 5-minute walk from the property. Easy access to the ski slopes. Great for skiers. Does the hotel offer any activities? Yes, ice fishing, canoeing, and reindeer safaris. dog sledding, reindeer sleigh and aurora hunting. There are also exciting new experiences, such as ice wall climbing and snow surfing, horse riding, snowboarding, sledging, kick-sledding, snowshoe hiking, fishing, canoeing, mountain biking, (fishing through a hole drilled in the frozen waterway), or even a swim in the winter ice pool. Facilities: the igloos are 32 sqm in size and can accommodate 2 to 4 people. The beds are motorised and perfect for sleeping under the glass ceiling. There is a designer sofa bed that serves as an extra bed for two more people. Private bathroom. Air con. Free WiFi. The kitchenette includes a fridge, French press, hobs, cutlery, dishwasher, and kettle. All the igloos are equipped with a toilet and shower. Breakfast at the nearby cafe is included with the price. What's special about this accommodation? Just 7 Northern Lights glass apartments and 5 aurora huts available to book so the guests will be able to relax in utmost privacy. 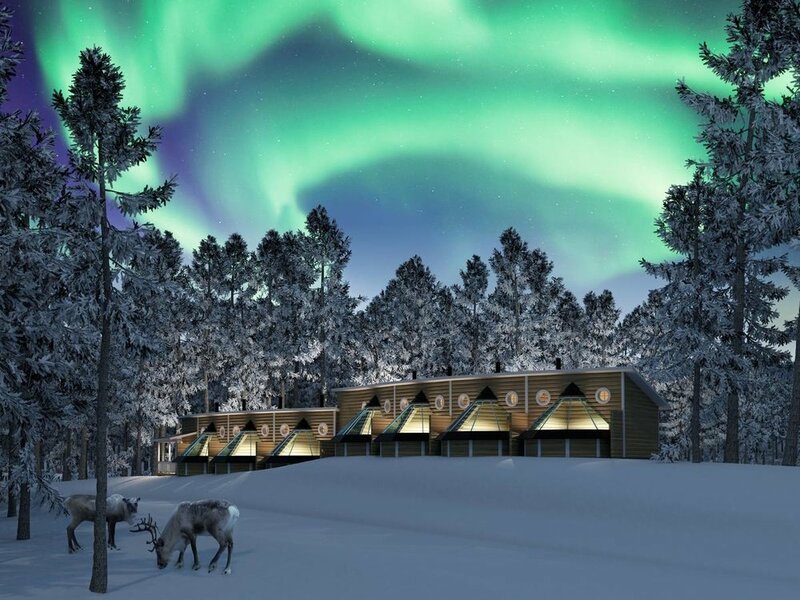 Located just north of the Arctic Circle, this resort offers unique cabins and wagons especially for aurora watching. Facilities: there are 10 Aurora Cabins on site equipped with double bed, convertible sofa and cosy bedding to ensure you stay toasty all night. There is also an on-site restaurant. Car rental service available upon request. The hotel also offers Aurora Wagons on wheels. What's special about this hotel? The hotel is just 17 km from Rovaniemi and 8 minutes the Santa Claus Village. It is the only hotel that offers aurora wagons. Does the hotel offer any activities? Yes, aurora hunting on a snowtrain, a visit to Husky farm on a snowtrain, sunrise snowmobile safari, Arctic fat biking, wilderness experience on a snowtrain, Apukka fun day, a visit to the reindeer farm, aurora Husky tour, Apukka aurora experience, and reindeer night safari in Apukka. Facilities: these Aurora Cabins are equipped with double beds and 2 extra beds under the huge glass roof. They each have a private bathroom with a shower and toilet, own fireplace, a minibar and free WiFi. What's special about this accommodation? The highlight of these cabins has to be the heated panorama glass roof, which stays free of snow and ice and the fireplace. Facilities: Fully equipped wagon with bed for two people. Kitchenette. Toilet. What's special about this accommodation? Unique way of watching the auroras in a wagon. These wagons are specially designed for taking trips in the forest and watching the auroras. You can relax in your luxury wagon away from other people and watch the Northern Lights in peace and quiet. No other resort offers such a unique experience. The Arctic Fox Igloos offers families and couples a complete package of fun activities and comfortable glass igloos. Facilities: restaurant with bar, transportation from the Holiday Village Gulo Gulo to the Igloo Village is organised by the hotel. Free parking. Open all-year round. What's special about this hotel? This hotel is located on the shores of the lakeRanuanjärvi and the Ranua Wildlife Park is just 5 km away. The hotel is located far away from city light pollution. Does the hotel offer any activities? Yes,the hotel offers snowmobile safari with ice fishing opportunities in Ranua, a 2-hour snowmobile safari in the forest, long horse sleigh rides, reindeer sled rides, Northern Lights safaris, searching for aurora borealis in Ranua Wilderness, reindeer farm visit, 1-hour Husky safari, snowshoe safari at night, wild night safari, arts and crafts workshop, Nordic skiing course, family snowmobile tour, daytrip to Rovaniemi, spa massages at the sauna, and even a private visit to Santa Claus at his secret cabin. What's special about this accommodation? Own private sauna. Unobstructed views across the open lake and the night sky. The next generation glass igloos are offered by Northern Lights Ranch in the heart of the Arctic Circle. Note: cabins tend me always fully booked. - Sky View Cabin Deluxe with outdoor Jacuzzi. What's special about this hotel? The 16 Sky View Cabins all feature huge glass roofs and windows, which makes them ideal for viewing the surrounding nature and the auroras. 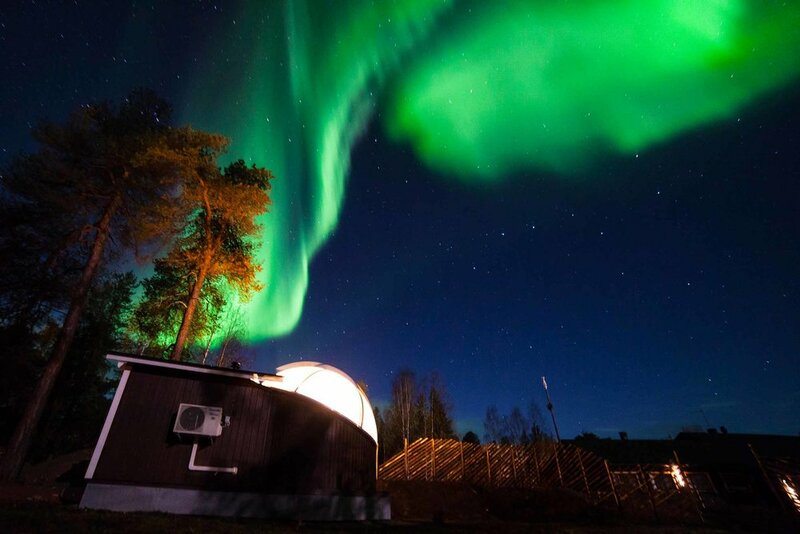 The hotel is located at nearly 200 km above the Arctic Circle so higher chance of seeing the auroras. The area is easily accessible from the Levi Ski Resort (15 km) yet unaffected by light pollution. Does the hotel offer any activities? Yes, any type of activity or special occasion the guest wants to take part in can be arranged on request. Facilities: these cabins are all designed in Scandinavian style and come with a fridge, minibar, kettle, and free WiFi. The cabins are designed for two people and have heated windows. What's special about this accommodation? Pets are allowed. The Standard Cabins are the smallest out of all the 4 models on offers. The huge heated windows and a glass ceiling are perfect for aurora watching. Facilities: a fridge, minibar, a coffee machine and a kettle. There is also free WiFi and a TV in the alcove. Motorised bed. What's special about this accommodation? The Superior Cabins come with a sofa bed, which can be used as an extra bed for child or adult. The huge heated windows and a glass ceiling are perfect for aurora watching. What's special about this accommodation? The Superior Cabin has a separate entrance lobby, private sauna, and a sofa bed. The huge heated windows and a glass ceiling are perfect for aurora watching. What's special about this accommodation? The Deluxe model has a separate entrance lobby and a sofa bed. The hot tub is specially designed to comfortably watch the auroras. The huge heated windows and a glass ceiling are perfect for aurora watching. 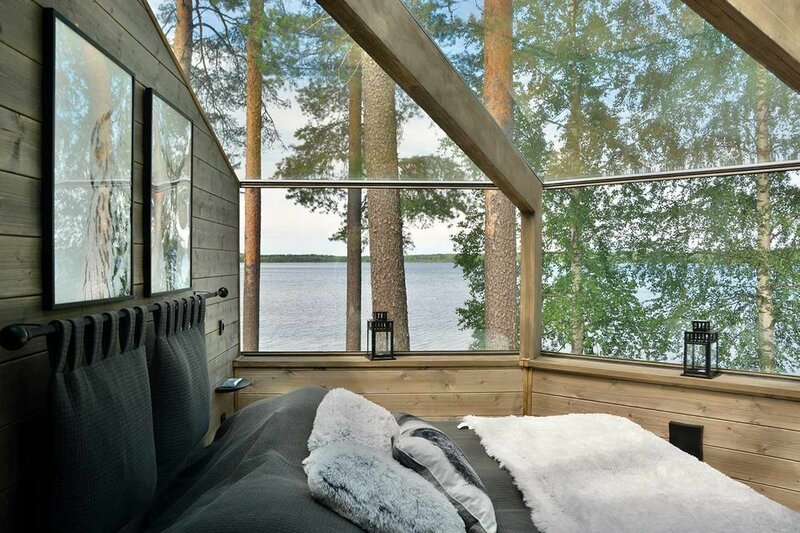 The unique landscape of Torassieppi Lake can be enjoyed from the comfort of your own Dome. This hotel offers a wide range of different sized cabins and villas that are surrounded by ancient forests. Facilities: on-site restaurant serving traditional Finnish food. Versatile accommodation from apartments, cabins, and huts to aurora domes. What's special about this hotel? Pallas-Yllästunturi National Park is within walking distance. This hotel offers all year round versatile accommodation. Does the hotel offer any activities? Yes, multi-adventure packages for both summer and winter. Snowmobiling, ice fishing, Husky rides, panorama safaris, skiing, snowshoeing, aurora campfire, reindeer aurora experience, and horse riding. There is a reindeer farm and Winter Village with the ice bars is nearby. Facilities: the domes are suitable for a maximum of one night stay with toilet, shower and sauna within walking distance. Each aurora dome has its own fireplace. There are only 4 aurora domes in total, which are often fully booked so make sure you book in advance. What's special about this accommodation? Stunning views of Muonio River. Complimentary small bottle of sparkling wine offered to every guest. You will feel totally relaxed in the middle of nature as there are only 4 domes offered by this hotel. 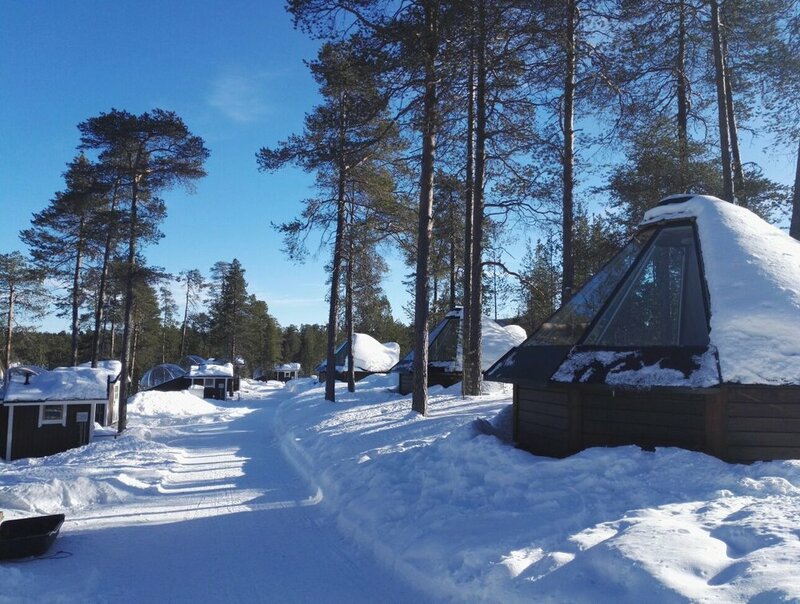 The hotel also offers snow igloos in Torassieppi Winter Village with the double bed made of snow. Facilities: the domes are suitable for a maximum of one night stay with toilet, shower and sauna located just 50 metres away. Each aurora dome has its own fireplace. For up to 2 persons. What's special about this accommodation? Complimentary small bottle of sparkling wine offered to every guest. You will feel totally relaxed in the middle of wilderness as there are only 4 domes offered by this hotel. Stunning views of lake Jerisjärvi. This family-owned hotel located on an old reindeer farm has been around for over 160 years. You can truly feel the Lappish culture when you stay at the Levin Lapinkylä Oy Hotel. Facilities: there are two restaurants that are open from October to April. The hotel has a smoke sauna for all to use. What's special about this hotel? It is located just 15 minutes from the centre of Levi. Excellent location for skiers. Does the hotel offer any activities? Yes, reindeer safaris and forest tours. Facilities: These spacious igloos are 25 sqm and have separate beds with sofa. They are equipped with fridge and kettle as well as free WiFi, bathroom, hairdryer, free toiletries, and bathrobes. What's special about this accommodation? The igloos can also be accessed with snowmobile or by skiing straight to the parking lot rather than walking to the entrance in the middle of heavy snow. Spacious accommodation. Sauna available? No but there is a smoke sauna available. This is a unique 300 sqm 5-star villa recently built in Levi’s prestigious Utsuvaara-neighbourhood. Facilities: 3-storey villa with 6 bedrooms, stone fireplace and outdoor Jacuzzi on the patio. The bedrooms are located on the 2nd and 3rd floor. There are 4 bathrooms on every floor. Restaurant is within walking distance. What's special about this hotel? This 5-star villa is idyllically located in the arctic wilderness near the Levi resort. The closest ski lift is only 1,200 metres away. The buzzing centre of Levi can be reached by car within 10 minutes. Does the hotel offer any activities? Yes, snow-shoeing and aurora hunting. A cross-country trail runs around the villa with easy access to snowmobile tracks. Facilities: 9 luxury villas located on the quiet side of the Levi fell near the river Ounasjoki and surrounded by nature. These are not igloos but actual villas with floor to ceiling windows for aurora watching, with their own, dining room, and furniture. The entry of the villa provides a large common area with fully equipped kitchen, fireplace, dining area and a lounge. The sauna has enough room for up to 12 people. The dressing room has its own fridge and glassware. What's special about this accommodation? 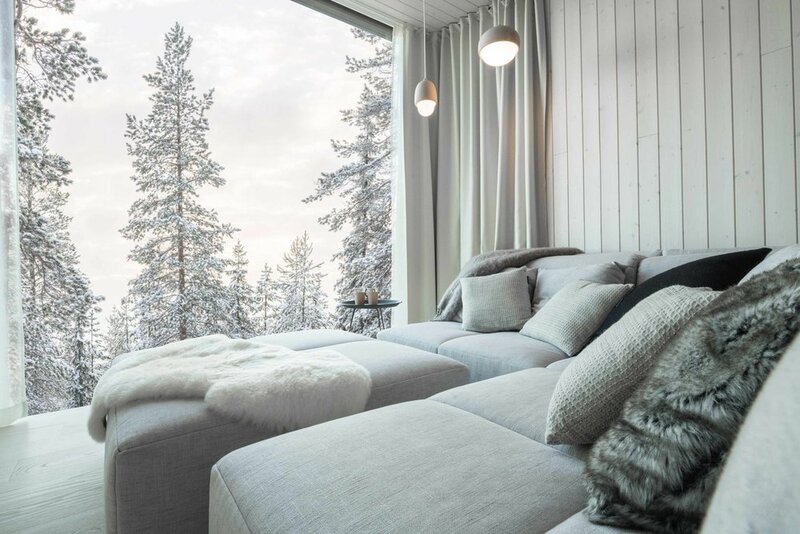 Located on top of a 360-metre foothill, the villa offers breathtaking views towards Lapland and the sky thanks to its floor to ceiling windows. When is the best time to book a glass igloo holiday to Finland? The best time to watch the aurora borealis is during winter months between November and March so you can book your cabin in an igloo village during those months. However, the Northern Lights aren’t visible every night of the week and there is a chance that you won’t get to see them at all. Most people choose to stay in these igloos for the experience and the exciting activities they can take part in during winter. Is Lapland dark throughout the day? In northern Lapland, you will often see a long period of darkness without the sun rising for many days. But this doesn’t occur everyday throughout winter. The shortest days are around December and January, while the longest days are during June and July. To give you a better idea, the daylight hours in December are approx. from 10am to 2pm, in January from appox. 11am to 2pm, in February from approx. 9am to 4pm, in March from approx. 7am to 5pm, in April from approx. 6.30am to 8pm, in May from approx. 4.30am to 10pm, in June from approx. 2.30am to midnight, in July from approx. 2.30am to midnight, in August from approx. 4am to 11pm, in September from approx. 6am to 9pm, in October from approx. 7am to 7pm, and in November from approx. 9am to 3pm. Both winter and summer seasons are full of activities for visitors and not even -30 degrees Celsius puts travellers off from coming to Lapland. 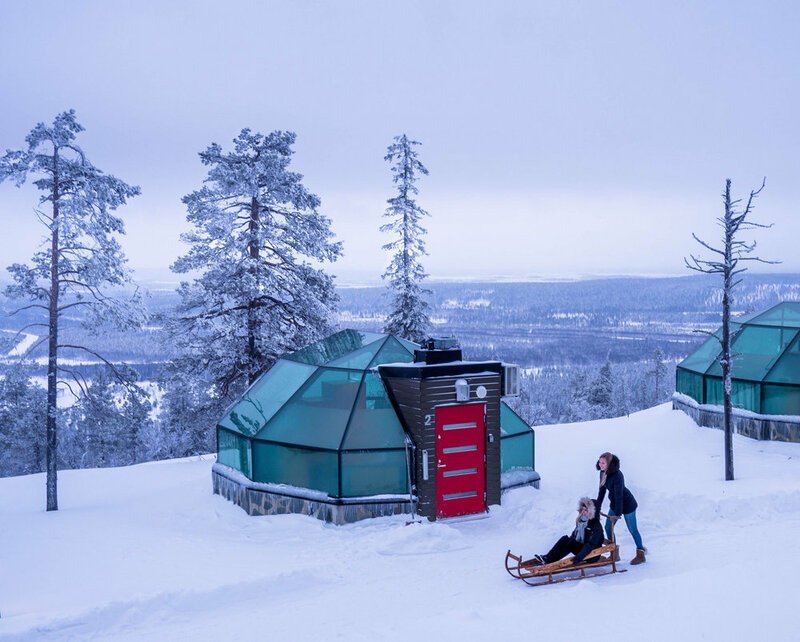 Where are the best glass igloos in Finland? There are numerous igloos with various types of facilities and activities for visitors. Before you book your Northern Lights igloo holidays, it’s best to take a look at our comparison chart to get a better idea of the best accommodation for your needs. Am I guaranteed to see the aurora borealis during my stay? There is no guarantee that you will see the auroras during your stay. To increase your chances, however, there are some things you can do. The peak hours for spotting the auroras are from 9pm to 1am, although this varies according to weather conditions. Some hotels provide a tablet in the igloo so as soon as the auroras become visible, an alarm notifies the guests. However, if you’re not lucky enough to see the auroras, you might want to stay at the resort longer and choose a hotel that's away from light pollution. The best months are at the end of February and March when there are no clouds and the sky is clear. During November and December, the sky is not as clear and can be rather cloudy due to the snow. Generally, the further north of the country you stay the better. However, if you are not lucky enough to see the lights, you will still have a great time snuggled up with your loved ones in an igloo. What’s it like to stay in a glass igloo? Your Northern Lights igloo experience will be unique like no other holiday you’ve ever had. The igloo cabins are more like part glass and part timber cabin. They are comfortable and warm with the magical views of the night sky right before your eyes. The luxury igloos feature a private sauna, fireplace, kitchenette, and a bedroom for two people. Having access to a sauna is a particularly advantageous treat during the extremely cold winter nights. But even when the outside temperatures drop below minus 40 degrees Celsius, inside the igloo will be warm and cosy. Although most aurora cottages and resorts are open all year round, it’s best to visit Finland in autumn or winter to maximise your chances of seeing the auroras due to clear skies and many hours of darkness, where you will truly experience the winter wonderland. What kind of activities can I take part in on my igloo holidays? If you want to meet the real Santa Claus, go snowmobiling through the forest, chase the auroras, or take a sleigh ride to the Husky farm. Whichever hotel you choose to stay at will arrange many such activities for a fee. Just take a look at our list of resorts with the activities they offer. 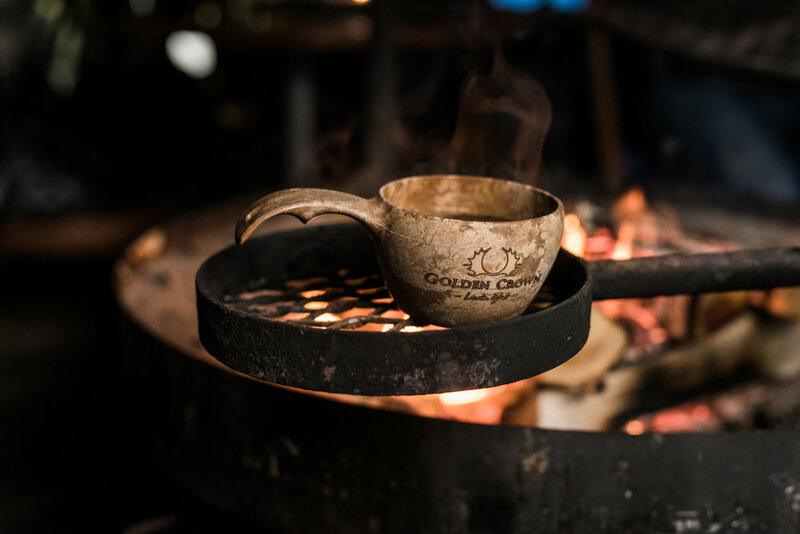 Some tours include hot drinks and lunch in the camping sites nearby. If you love skiing, you can rent all your ski accessories from the hotel and enjoy the Finnish slopes that are right at your igloo’s doorstep. Are there any glass igloos for families? Yes there are plenty of family-friendly glass igloos in Finland. Just browse through our list and select your favourite resort. Can I bring my luggage to the cabin? Most igloos are over 20 sqm so they provide enough space for your luggage. However, if you wish, you can use the hotel’s luggage room instead. Yes, most accommodations offer breakfast. Is it a health risk to stay in a glass igloo when it’s below zero degrees? No, it's not a health risk as most glass igloos are equipped with a fireplace or they have thermal glass windows and underfloor heating so you won't feel the cold. But be aware that temperatures can drop as low as -30 degrees in Lapland during winter, so be prepared for your trip and make sure you take warm clothes with you. Do I need special winter clothing to stay in a glass cabin? Yes, you do need special clothing. You should wear one layer of thermal underwear, which must be waterproof. Keep in mind that your body should be fully covered from head to toe and wear as many layers as you need to, otherwise you will feel cold. Always avoid getting your clothes wet and opt for clean and dry socks. If you don’t have adequate winter clothing, you can rent woolly socks, shoes, gloves, trousers, and hats from your hotel. Is there mobile coverage in glass igloos? Every Finland igloo resort has excellent mobile coverage so you won’t feel isolated from the rest of the world in the middle of the wilderness. Most igloos are provided with free WiFi connection. Where is the cheapest igloo I can stay in? Refer to our Northern Lights price comparison chart to find the cheapest glass igloo in Finland. Which Finland northern lights hotel in Lapland offers hot tub? In Pyhätunturi, Pyha Igloos offer an outdoor hot tub. There is also the Snowman World Glass Resort in Rovaniemi plus a few others as per our list. Are pets allowed in an igloo hotel Finland? Yes, some hotels do allow pets like the Kakslauttanen Arctic Resort in Saariselka. It’s best to first check on the website of these hotels before booking. Should I bring my own towels? No, towels are provided in all the rooms. Will I not feel claustrophobic in an aurora borealis glass igloo? It depends on the size of your cabin. Most are up to 25 sqm so plenty of space to spread your wings. However, if you travel on your own, you might feel a little lonely. An aurora borealis cabin is best experienced with your partner or family. Any aurora cabins to avoid? This depends on your own preferences. For example, if you enjoy isolation and want to stay in the middle of wilderness, you might want to avoid densely populated resorts with lots of igloos like the Northern Lights Village in Saariselkä or the Kakslauttanen Arctic Resort in Saariselkä. It is advisable to choose hotels that only offer a handful of cabins. Another factor to consider is the location of the hotel. If it is close to villages or towns, you will experience light pollution, which is bad for aurora watching. In addition, in the northern region of Finland there is more snow than the other parts, depending on the time you visit. Bear in mind that some rooms cost more than 600 euros per night so you will want to make sure it comes with all the necessary amenities. Check out our comparison chart and once you have selected your favourite resorts, go to the booking website and read the customer reviews. Scandinavian countries have the cleanest tap water in the world. You can safely drink the pure and fresh water in your igloo. Will I have privacy in my igloo? Yes, the igloos offer good privacy as their windows are high enough to allow you to enjoy the views without anyone else seeing you from outside. How long do the auroras last? Northern Lights can last anywhere from ten minutes to the whole night, depending on the incoming solar wind's magnitude. These coronal holes are responsible for creating the beautiful auroras, but generally, the bigger the holes, the more spectacular the aurora display show will be.